Home » Seasonal Decor Trends » Decorate As You Dress — My Coral Coach Purse!! Decorate As You Dress — My Coral Coach Purse!! The first “Decorate as You Dress” post is all about my brand new Coral Coach purse I purchased over March break. Isn’t it a gorgeous, fresh colour…..it’s so punchy and look how fabulous it looks with leopard print. Coral/orange and anything leopard print is a definite GLAM SLAM!! And look how glorious it looks matched with a Victoria Ghost Chair by Philippe Starck for Kartell. 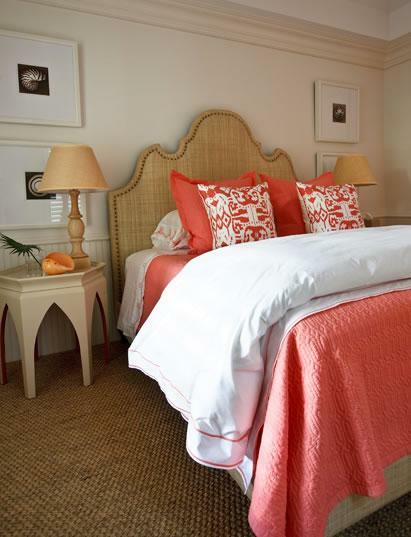 Now this is how I would decorate a room based on my coral Coach purse!! 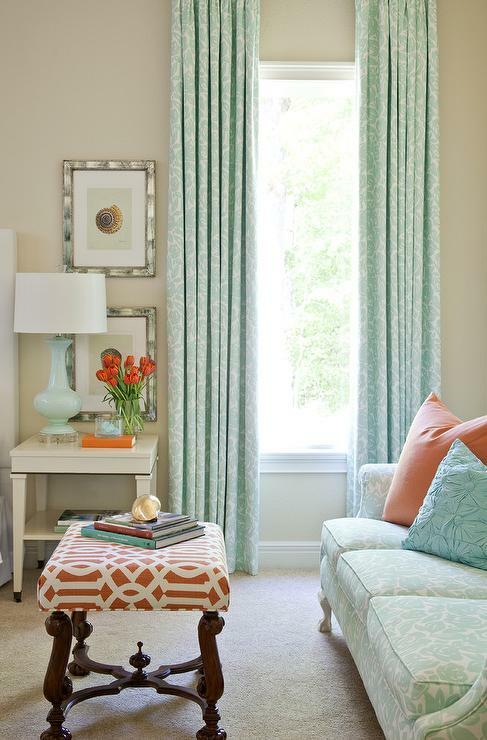 If you love coral, why not go for slip-covered comfy chairs and drapery in a coral & white print offset by turquoise blue. Now that’s a fantastic colour combination!! Here`s the same colour combination n a room designed by Tobi Fairley. Love the hits of coral in the ottoman and sofa cushions…and of course, we can`t forget about the orange book on the end table!! How about shots of coral on the walls and and flooring through wallpaper and and a great patterned rug….this bathroom leaves me in a happy mood — it`s a happy room!! One of the quickest ways to update your home for spring is to add a jolt of colour, like this coral bedding to this bedroom. I adore this office with its orange arabesque rug, glass-top desk, and natural linen roman shades with orange ribbon trim. So very chic. And what about the living room below. Greys and corals are magnificent together. 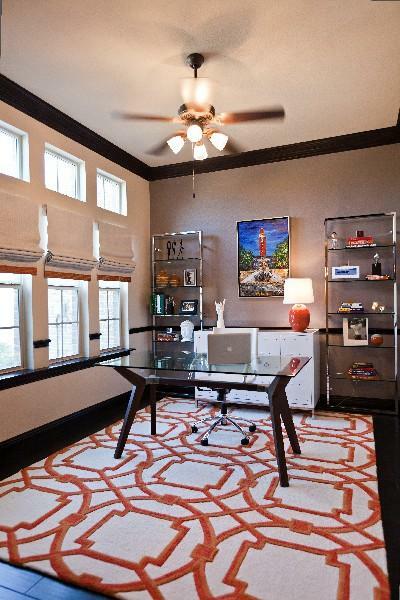 The artwork and area rug are both absolutely beautiful and give this room so much personality. Well, I hope you enjoyed my first “Decorate As You Dress“ post…and I hope my coral coach purse has inspired you to add some lovely coral accents into your home this spring!! Now if you want to join in on the fun, then you too can be featured in a Decorate as you Dress weekly post. Just send me a photo of something you love in your closet and (if you are brave)pictures of similar inspired decor OR I will find the decor inspiration for you and blog about it and you in the upcoming weeks. Have a fabulously glamorous week!! Oh la la- love coral in every possible way and your purse, divine. Lovely post CD!! Thanks Christine D. Coral = SPRING! I’m planning to decorate my bathroom using shades of coral, white, turquoise/blue, and yellow! Thanks Sara….glad you found me!! Good luck with your bathroom decorating project!! !